Add some royal touch to your child's bedroom with this versatile and lovely pinch pleat Princess Curtain! Princess pattern lace curtains are perfect to decorate your little princess's bedroom! Watch how this beautiful window treatment transforms an otherwise ordinary room into an elegant room fit for a royal princess! 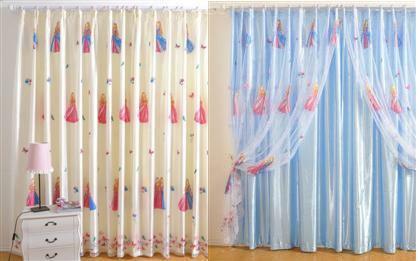 Made of high quality material, thps kid's curtain is durable enough for long time use. From left to right, featured curtain design's close-up view and the blue color option.